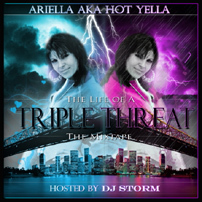 Tallahassee-born (but Las Vegas, NV and Madison, WI bred) triple-threat Ariella “Hot Yella” Asher has came into the capital city and injected huge doses of “chick swag” for all to share! If you have never seen a young 19-year-old female on her grind, I present to you the prototype. This actress/singer/songwriter just released her heavily contagious FREE LP titled “The Life of a Triple Threat” and you are getting it free TODAY! The links are labeled below! Peep below for videos of “Chick Swag” being placed in rotation on WWLD Blazin’ 102.3FM (Tallahassee, FL) by Superstar J Kwik & DJ Storm!